Music helps us heal physically, mentally, and emotionally. Research suggests that music stimulates the pituitary gland, secretions of which affect the nervous system and the flow of blood. Music relaxes and rejuvenates the mind. 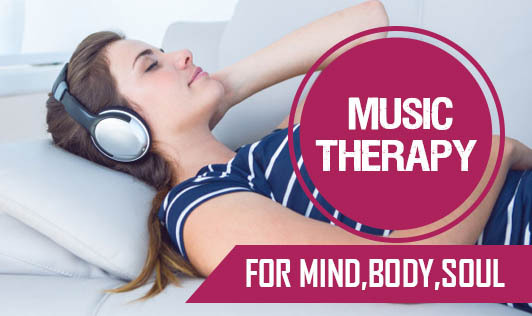 Music therapy also known as sound therapy is used for many purposes. The right kind of music, if played during working can considerably increase the efficiency. It can be used as a relaxing technique after working hours too and can act as a mood changer. Music therapy for pregnant women is now gaining popularity, though it is an ancient concept. It is believed that the child in the womb is affected by everything which the mother is exposed to or surrounded by it. A few ragas from classical music help in the psychological and emotional development of the child in the womb. Music is also used to control the negative aspects of personality like anger, worry, sadness, irritation, and depression. It is a very effective method of controlling a wide range of emotions. As said rightly, music is what feelings sound like! Many studies have shown that music therapy also has been effective in treating insomnia, high and low blood pressure, schizophrenia, epilepsy, and mood disorders. It is also believed to help relieve pain as it can distract the mind to such an extent that the feeling of pain becomes secondary. Music helps in improving concentration, but the kind of music which one might like is individualized. The effect of different types of music varies for each individual. It is also used for meditation to achieve peace of mind. It is important to have knowledge about the kind of music to be used for any specific purpose. The duration for which the therapy is to be administered also matters. So, it is best to consult a music therapist to get the desired results.